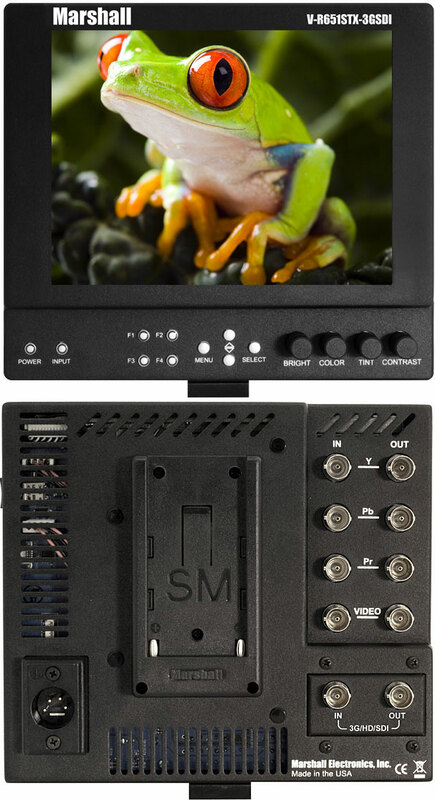 V-LCD651STX-3GSDI monitor is a 6.5-inch high-definition Super Transflective LCD series of monitors featuring our completely digital TFT-MegaPixel active matrix LCD platform. With built-in focus assist and false color filters, this monitor is ideal as a light-weight high resolution viewfinder or focus-assist monitor. Our proprietary digital signal processing features 10-bit A/D conversion of all analog signals, with 4X over-sampling and 5-line super-adaptive 2D comb filtering of composite signals. 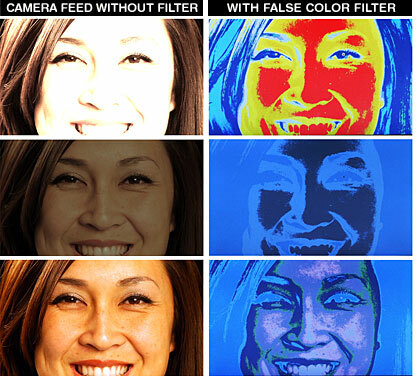 De-interlacing is performed using our HyperProcess algorithm with motion adaptive interpolation. 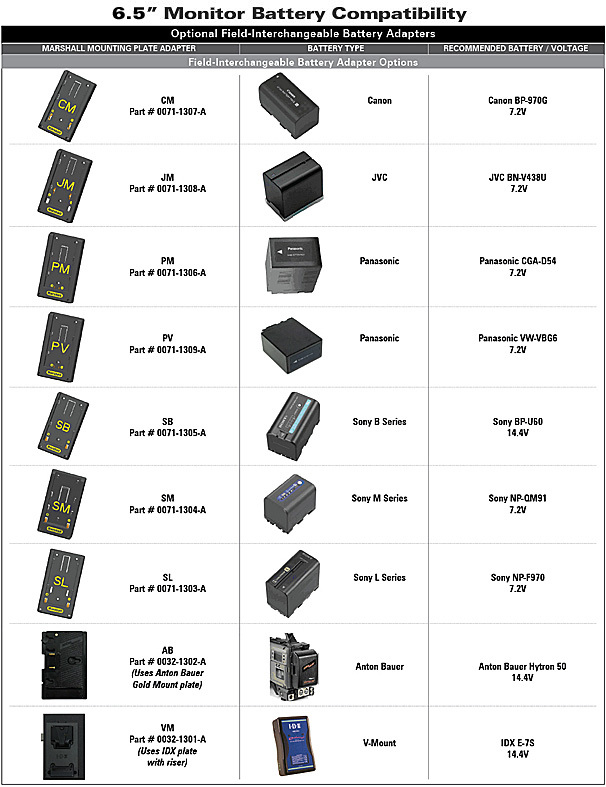 Multiformat compatibility accommodates virtually all video formats - NTSC/PAL, 480i/p, 720p, 1080i/p. HDMI model also available with different battery adapters. The V-LCD651STX-3GSDI is the latest update to Marshall's line of Super Transflective Outdoor Monitors. 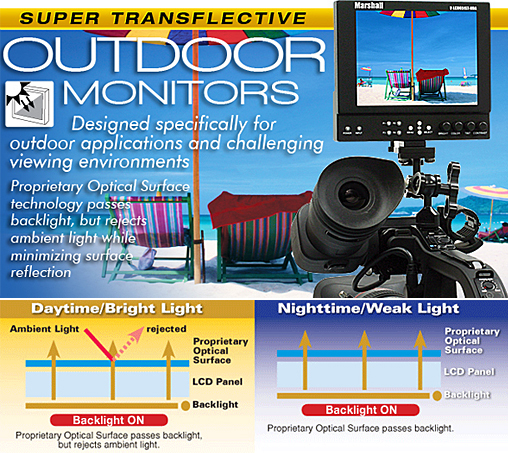 This 6.5" portable field / camera-top monitor is designed specifically for outdoor applications with high ambient light. Our technology minimizes surface reflection of both outdoor and indoor light, while featuring a much wider color reproduction range than typical transflective/reflective LCDs or even those with increased backlight performance. Marshall's outdoor super-transmissive LCDs provide improved visibility by producing high-contrast images and a wider viewing angle, even under diverse and challenging lighting environments. This innovative technology dramatically boosts the efficiency of the LCD backlight's light utilization, while maintaining extended temperature ratings and low power consumption for outdoor operation. 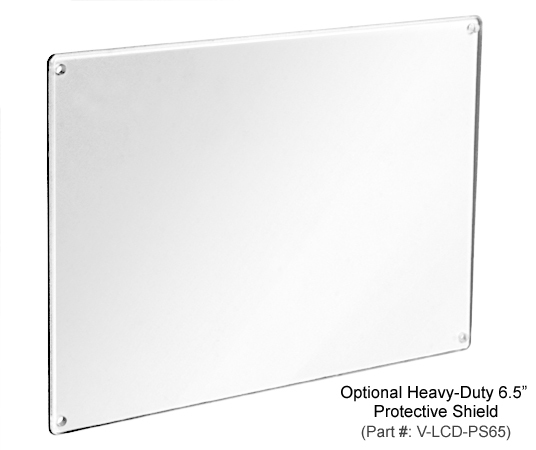 The V-LCD651STX-3GSDI offers a durable and lightweight design, weighing in at only 1.3 pounds. It also features our completely digital TFT-MegaPixel high resolution LCD screen with 2.4 million pixels, 4-pin XLR power jack, and optical-grade polycarbonate screen protection. Analog signals are digitized using advanced 10-bit processing with 4x oversampling and adaptive 5-line comb filter.